Our school encourages children to walk to school each day. In order to do this we have organised Walking School Buses. This requires a parent to walk to school each day on a specific route with groups of children. If you would like your child to catch the bus then once a week you may have to be the bus driver. On a walking school bus children walk under the supervision of adult volunteers, creating a safe and social journey to school. Other benefits include reduced congestion around the school gates and a more connected community. Children are collected from stops along a planned route to school. 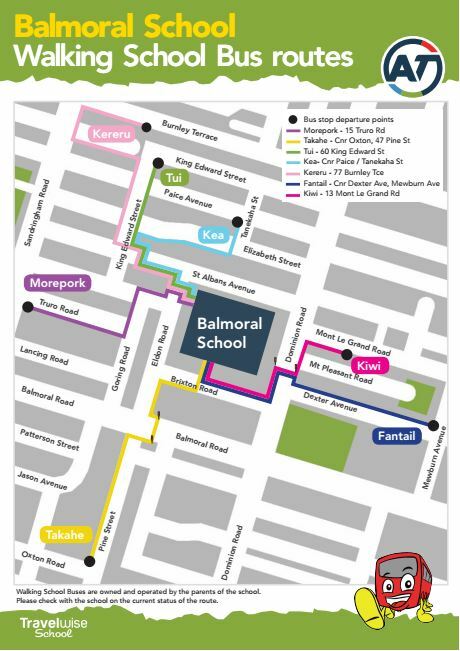 Balmoral School currently has seven bus routes, shown below. They start either at 8:20am or 8:30am and require a parent to volunteer as a driver at least once a week. Buses can also operate in the afternoons on the trip home from school.